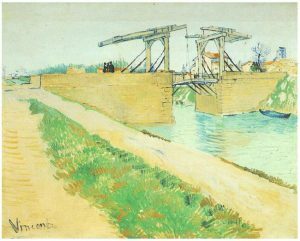 During his stay in Arles, Vincent did a study on the Langlois bridge. Unfortunately, it is no longer in its original spot, as it was replaced by another bridge and then later replicated. In homage to Van Gogh, the replication was renamed Pont van Gogh. It’s fitting given that the bridge inspired Vincent van Gogh to paint four oil paintings, four drawings, and four watercolors. Van Gogh completed this study in 1888. While this study will be referred to here as “Langlois Bridge with Washer Women, etc,” it also goes by “Drawbridge with Washer Women” as well as a variety of similar names. The title seems to depend on the whims of the translator. 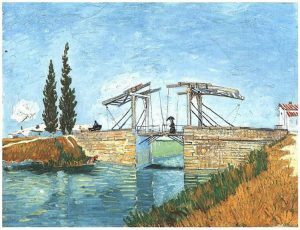 Oddly enough, Van Gogh himself mistook the bridge’s name, having misheard it as “Pont de l’Anglais” (The English Bridge). What drew Van Gogh to the bridge was its resemblance to the ones in the Netherlands. This was not a mistake or a trick of the eye; a Dutchman had been the engineer who designed the bridge. So for Van Gogh it was a little bit of home in France. The Langlois Bridge with Washerwomen is two out of the four oil paintings. The first Van Gogh sent to his former supervisor, Herman Tersteeg, at the Goupil & Cie art dealership so that he would have an example of his work. Van Gogh completed the original around March 16th; he mentioned it in a letter to his younger brother Theo. He later made a copy that he sent to him. 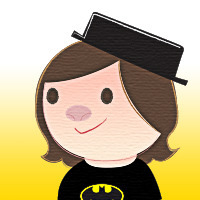 The painting follows his typical style. It is a slice of life, where his focus is not on capturing merely the people at work but on the scene as a whole. All the women are focused on their task, wholly separate from the carriage driving over the bridge. Two separate instances combined into a full picture of daily life. His color choice denotes a bright, sunny day. One that is middle of the summer hot. The stones of the bridge appear warmed by the sun in yellow and grey brushstrokes. The grass appears dry, yellowed from the sun, and even the dirt is a red-brown that appears burnt from its rays. Van Gogh completed this painting some time in May of 1888. He mentions starting it in a letter to Theo dated around May 14th, 1888. It’s a small aside of little note. What is significant is how he describes the colors of Arles comparing to those of the Netherlands in the following sentence. As he puts it, “There’s sulfur everywhere where the sun beats down.” For the previous two paintings, yellow tones were prevalent. It was sulphurous. In contrast, the painting above is cooler, easier. Yellow is still worked into the painting; the stones on the bridge are yellower than the last two. It’s in the ripples of the water; it trails down from the path on the far bank. Yet here yellow is less heated. The bright blue of the sky dominates the picture but does not overwhelm the rest of the scene. The sun shines, demonstrated by the woman walking with a parasol, but the blue of the sky tempers its heat. This painting has little “action;” its focus is on the bridge and its surroundings rather than the person in it. She merely part of the background. As with the first two, this painting was done some time in March 1888. An unusual point about this painting is that it is a reworking of another piece that Van Gogh had made that has since been destroyed. The other piece had the same view, only with a couple walking in it. He sent a description of it to friend and fellow artist Emile Bernard in a letter. Only a fragment of the walking couple painting remains today. In a letter to Theo, Van Gogh mentioned trouble that he is having with the walking couple painting and added that he started this painting immediately after, but “as the weather was quite different, in a grey palette and without figures.” Van Gogh followed in the tradition of Impressionist and Post-Impressionists artists, in that if the scenery around the subject changed, so too did the work. His art is a response to his surroundings and how he viewed them. In this case, the colors are muted, lacking the vibrancy of the other three paintings. It’s emptier. While not lifeless, as there are people milling about the bridge and the grass along the road is greener than the other paintings, the greyer tones used here do give it less energy. The lethargy brought by stormy weather sucked all vigor out of the scene and left it a shadow of itself. This series provides an exceptional example of how Vincent van Gogh looked at the same subject and saw it differently each time. It encapsulates brief moments to show how each scene, while having similar subjects, is a separate and equally valuable moment to preserve. Individually , the moments are strong, but when they are placed together they form a better understanding of subject as a whole.